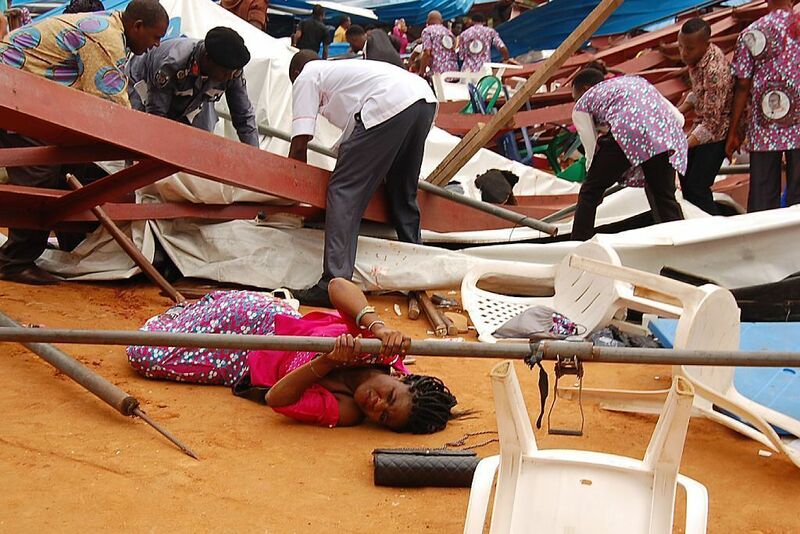 Nigeria Investigating What Caused Church Collapse That Killed Scores Of Worshippers : The Two-Way Worshippers were celebrating the ordination of a bishop on Saturday when, witnesses say, metal girders in the hastily constructed church buckled and crashed onto them. The roof then caved in. A woman lies under a scaffolding bar Saturday after the collapse at a church in the remote southeastern city of Uyo, the capital of Nigeria's Akwa Ibom state. Authorities were trying to determine the cause of a church collapse on Saturday in southeast Nigeria that killed scores of worshippers as they attended the ordination ceremony of a bishop. "Hundreds of people — including the governor of Nigeria's Akwa Ibom state in the south — were inside Reigners Bible Church International in Uyo when metal girders reportedly buckled and crashed onto worshippers," NPR's Ofeibea Quist-Arcton told our Newscast unit. "Witnesses say the corrugated tin roof caved in." There were conflicting reports about the death toll. The medical director of a hospital told The Associated Press that 160 people died. Reuters reported that a state police spokeswoman put the toll significantly lower, at 27, but that a photojournalist at the scene counted more than 100 bodies. The governor who survived the collapse, Udom Emmanuel, has ordered the arrest of the church's contractor, according to the state-run NAN news agency. The state government launched a probe into the incident and vowed to punish anyone "found to have compromised professional standards in erecting the building," NAN reported. Ofeibea said the church was still under construction when it collapsed and that it was built quickly in order to be used for Saturday's ceremony. Construction safety standards are notoriously lax in Nigeria, she said, adding: "Some contractors use below-par materials, corruption and bribery to ensure inspectors don't insist on building permits and ignore sub-standard work." Mortuaries in the city of Uyo were overwhelmed with bodies after the collapse, and a local youth leader told the AP that "many of the dead were taken to private mortuaries scattered across the city" and "some people were taking the bodies of relatives to their homes because of the overcrowding." Witnesses told the local Punch newspaper that the congregation was dancing at the time of the building collapse. "I was inside the church. Everything was normal; there was no problem," says witness Eno Etim. "A lady was called to lead the praise worship session; the governor came in shortly after that. As the praise worship was going on, the building fell and I didn't know how I got here." The bishop who was being ordained was unhurt, according to local media reports.